For the first time, researchers used benzene - a common hydrocarbon - to create a novel kind of molecular nanotube, which could lead to new nanocarbon-based semiconductor applications. Researchers from the Department of Chemistry have been hard at work in their recently renovated lab in the University of Tokyo's Graduate School of Science. The pristine environment and smart layout affords them ample opportunities for exciting experiments. Professor Hiroyuki Isobe and colleagues share an appreciation for "beautiful" molecular structures and created something that is not only beautiful but is also a first for chemistry. The researchers' novel process of synthesis starts with benzene, a hexagonal ring of six carbon atoms. They use reactions to combine six of these benzenes to make a larger hexagonal ring called a cyclo-meta-phenylene (CMP). 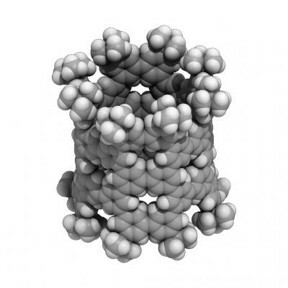 Platinum atoms are then used which allow four CMPs to form an open-ended cube. When the platinum is removed, the cube springs into a thick circle and this is furnished with bridging molecules on both ends enabling the tube shape. "A crystal of pNT is also interesting: The pNT molecules are aligned and packed in a lattice rich with pores and voids," Isobe explains. "These nanopores can encapsulate various substances which imbue the pNT crystal with properties useful in electronic applications. One molecule we successfully embedded into pNT was a large carbon molecule called fullerene (C70)." "A team lead by Kroto/Curl/Smalley discovered fullerenes in 1985. It is said that Sir Harold Kroto fell in love with the beautiful molecule," continues Isobe. "We feel the same way about pNT. We were shocked to see the molecular structure from crystallographic analysis. A perfect cylindrical structure with fourfold symmetry emerges from our chemical synthesis." "After a few decades since the discovery, this beautiful molecule, fullerene, has found various utilities and applications," adds Isobe. "We hope that the beauty of our molecule is also pointing to unique properties and useful functions waiting to be discovered."